I was in search for websites that let me upload audio files mainly MP3 and embed them to where ever I want with the provided embed code. Similar to the massively popular youtube for video, I was trying to find youtube like sites for audio. Entertonement.com is another site that also has a good collection of audio files. With its AJAXy interface it is also a good one to have a look at. This site also takes some time to process the file. Entrotainment has an API and lots of features so this might be a good bet as well. Here also you have to register to reap the benefits. It has 3 kinds of playes to choose from: blog card, inline player and regular player. See the player of this site below, this is the regular one. 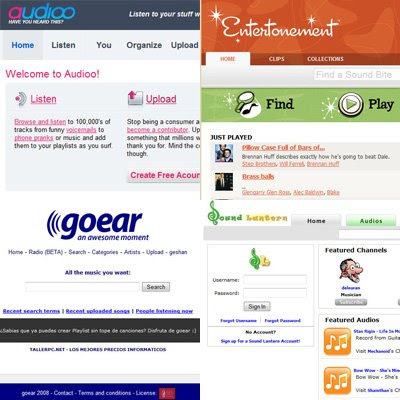 There are other sites like imeem.com but it seems like a social networking site that allows embedding audio. Hope you like the collection and start podcasting or embedding audio files without thinking about space and bandwidth problems. None of the site mention particular space, length of files and bandwidth provided so its a question mark there as well.